The Edition 2 sections 8.7.1 – 8.7.5 were reformatted, with unchanged content, in Edition 3 of the Patterns of Power books. Other links from this page are coloured sepia because they are also to Edition 2 material, to avoid confusion with Edition 3 revisions that exist for some material from earlier chapters. The war was very unlikely to succeed in military terms, irrespective of whether its purpose was self-defence for America and Britain or to ensure peace in the region (8.7.1). From an economic perspective it was both unnecessary and costly for the countries involved (8.7.2). From a moral perspective it was an inappropriate solution to prevent abuses of human rights (8.7.3). There is little doubt that it was illegal under international law (8.7.4). 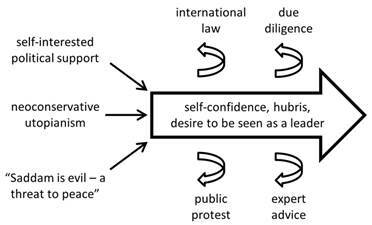 It was a highly risky way of bringing about political change, with no clear picture of how to achieve it (8.7.5). This absence of a compelling justification begs the question of what was the real reason for the war. Both George W. Bush (8.4.5) and Tony Blair (8.5.5) had a strong personal desire to overthrow Saddam Hussein’s regime. Both of them had described it as ‘evil’ (which is a word that has a strong religious resonance). They believed that the Iraqi people and the region as a whole would benefit from introducing democracy to Iraq. Both leaders had an instinct for how to win domestic political support so they emphasised the possibility of a threat from WMD and positioned the invasion as if it were an act of self-defence. The link to an external threat made a ‘war on terrorism’ appear to be a ‘just war’ – having redefined that concept to include the use of a pre-emptive strike (a contentious claim). The concept of a ‘war on terrorism’ gave a form of political legitimacy to both men as protectors of the people (6.3.6) – though they appear to have discounted the short-lived nature of support for foreign wars. Since the 9/11 attack was so recent, people’s sense of being threatened was sufficiently strong to give credence to the argument that they shouldn’t wait for the UN weapons inspectors to finish their work. The American Administration was subject to other political pressures, from the oil industry and the Jewish lobby (8.4.5). The American decision was consistent with a bipartisan belief in a coercive foreign policy, which has multiple foreseeable disadvantages (6.7.7.1 and 7.4.7). Tony Blair used his personality to overcome significant resistance from within his party and in the country (8.5.2 and 8.5.5). The Chilcot Inquiry will doubtless shed more light on the British decision-making process. Both leaders persuaded their legislatures that the war was necessary and the right thing to do. They made impassioned speeches and they were able to position the invasion as a patriotic necessity, creating political momentum in both the major political parties in both countries. Although they cited the security threat as the main reason for the war, they drew attention to Saddam’s behaviour towards his own people as a way of harnessing moral fervour to their cause. Passion triumphed over process in both countries. Peace and security was unlikely to be improved for either country (8.7.1), and it should have been apparent that international security would be damaged by invading Iraq at that time. People are entitled to expect that a war, as a public project, should be competently managed. This includes adequate preparation – which would have revealed the potential costs and the risks inherent in going to war without having a credible political plan for how to re-stabilise Iraq. The lack of due diligence was astonishing. The process of seeking the people’s consent, via Congress and Parliament, was rendered valueless by political dishonesty in both countries and by the lack of transparency (6.8.5.1) and accountability (6.8.5.2). For such a momentous decision it was necessary, at the very least, to prepare a structured analysis of the likely costs, benefits and risks before asking for authorisation by the legislature. Much of this information could not be made public at the time of such a decision, but it could have been shared with cross-party select committees which could contribute a summary report for each politician to read before voting on the issue; it would also have helped subsequent audit of the decision. Both leaders had ideological reasons for the invasion, but the invasion was not in their people’s interests: the invasion came at a very high economic cost, a cost in lives of soldiers and Iraqi civilians, the risk of destabilising the Middle East, and the undermining of the UN. The only obvious beneficiaries, apart from Al-Qaeda, were some big corporations. The 2003 invasion by the coalition cannot be retrospectively justified by Iraq eventually becoming a peaceful democracy, if that happens. It could be argued that there were better ways of helping it to change. Any such arguments are speculative. What is incontrovertible is that there were governance failings in taking the decision to go to war at that time, with that coalition. A PDF copy of the book’s Introduction, was available in April 2014 at http://ukcatalogue.oup.com/product/9780199562961.do. In January 2014 the Chilcot Inquiry’s progress was reported on its website at http://www.iraqinquiry.org.uk/. It did not predict when it would be published. The transcript of this lecture was available in April 2014 at http://www.carnegiecouncil.org/studio/multimedia/20040413/index.html#section-10815; the quoted comment is near the end of the transcript. Nye’s argument applies to the way in which force was used. Other counterfactual arguments can also be put forward for what might have happened if different decisions had been taken: specific abuses of power could have been prosecuted through the ICC, for example. All counterfactual history is, by its nature, largely speculative.